Originally released three years ago as part of a multi-authored series, RJ Scott has re-released Seth & Casey, a novella about husbands Seth Wild and Casey McGuire. 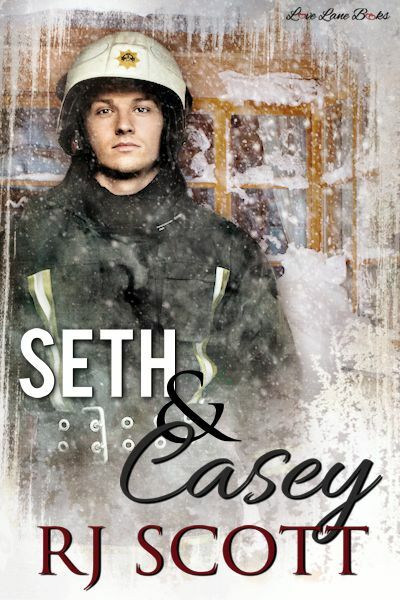 Friends since Seth was ten and Casey was eight, in love since they were teenagers, and married for five years, these two men facing a tumultuous time in their relationship. After suffering numerous injuries during a fire, Seth has spent the past six months growing angrier and more despondent over his eight-year career as a firefighter. Casey's tried to be there by his side, but with his husband shutting him out and refusing to speak to a therapist, they've reached a breaking point. As Seth pulls away, he, in turn, pushes Casey away. When the school teacher and his students--including their nephew--are trapped by the monstrous snowstorm, Seth vows to rescue them, but is it too late for him to rescue his marriage? Purchase Seth & Casey on Amazon | B&N | Kobo.